T-Mobile UK has made the LG Optimus Black available for purchase on its site. Even better, the handset is available for free if you sign a two-year contract that costs $41 (£26) or more. The LG Optimus Black, which was announced back at CES 2011, features the ultra bright 700 nit NOVA Display (more info on it here) and is only 0.36-inch thin. The other highlights are its 1GHz TI OMAP 3 processor, 4-inch screen and two cameras - rear one with 5MP and a front-facer with 2MP. Sadly, the phone runs Froyo rather than Gingerbread, but that could change. As of now, there is no information when and if we will see this device in the US. Notice the line - "Connect other devices without a Wireless Router" - Plans sponsored phone tethering - see that US cell phone carriers. Well 3D is now the present of smartphones. Just wait for another some years life will be full of 3D around the world. 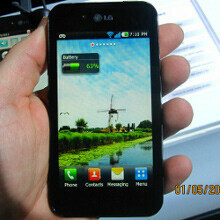 LG Optimus is one great example of such innovation. HTC EVO 3D is also in the line. Well LG has given a good deal for its audience.